The Audi A7 proves that headlights -- and regulations -- don't have to be boring. 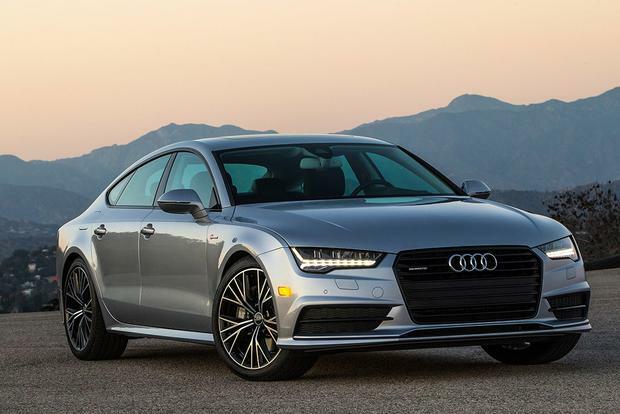 2018 vs. 2019 Audi A7: What's the Difference? This sleek liftback gets a nice update for 2019. 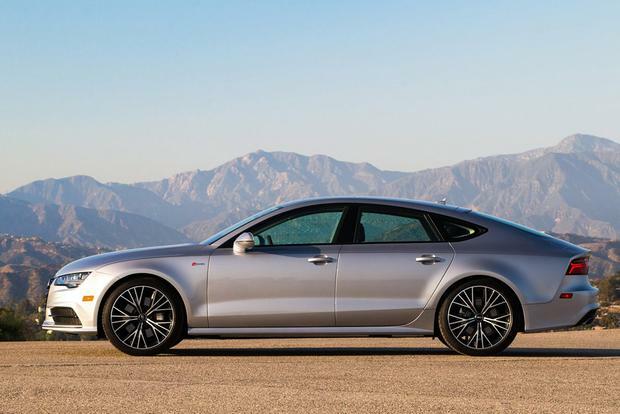 The 2018 Audi A7 stands out in the automotive landscape as a premium midsize hatchback that's both graceful and useful. 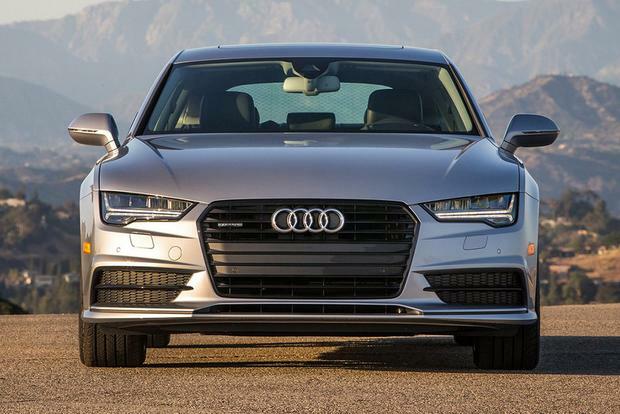 2016 Audi A6 vs. 2016 Audi A7: What's the Difference? We're comparing the 2016 Audi A6 and the 2016 Audi A7 luxury models to find out exactly what separates them beyond trunk design. Monday's here, and that means it's time for our favorite weekly quiz. 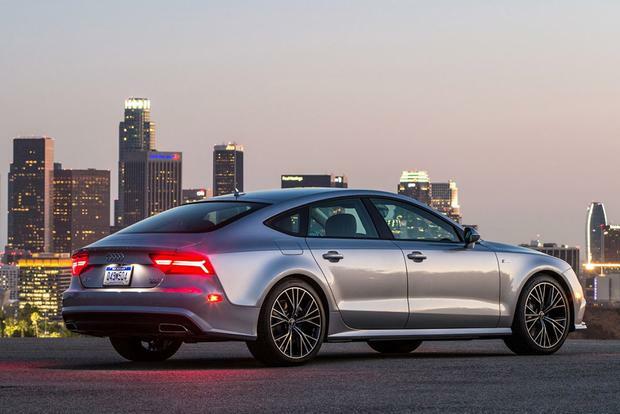 The 2016 Audi A7 is a candidate in the class that plays fast and loose with car definitions: the 4-door coupe. When Mercedes-Benz first described its CLS this way, the company really meant it was a premium sedan with a dramatically sloping roofline. In this case, the sedan foundation is the excellent A6, but the A7 carves an upmarket niche for itself, starting with a well-equipped trim level and dispensing with the A6 range's least powerful engine. Cargo space beneath the power-operated hatchback is a generous 24.5 cu ft. with the rear seats in place. For comparison, the A6's trunk holds 14.1 cu ft. 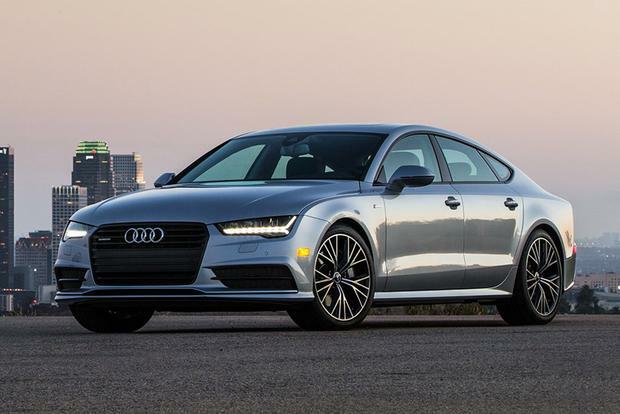 The A7 is undoubtedly versatile for a luxury performance car. 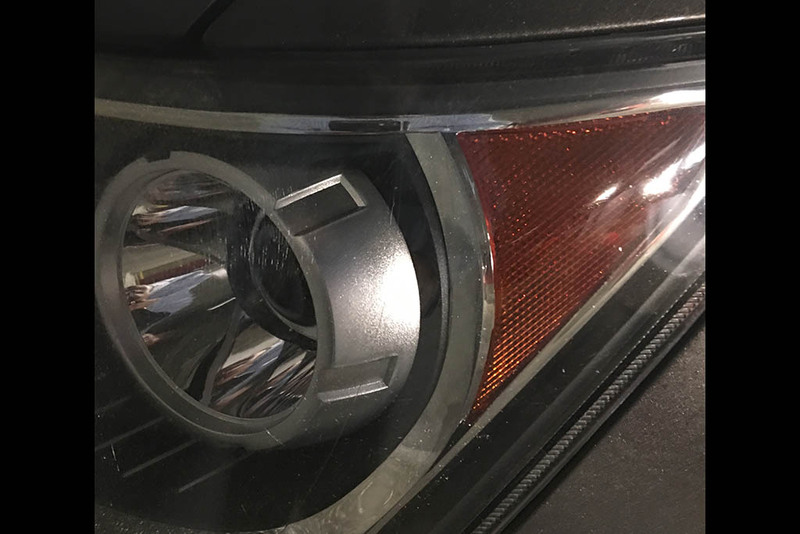 The front fascia has been redesigned to accommodate LED headlights, and the rear has revised LED taillights. The grille and bumpers received tweaks, while the rear bumper integrated trapezoidal tailpipes. 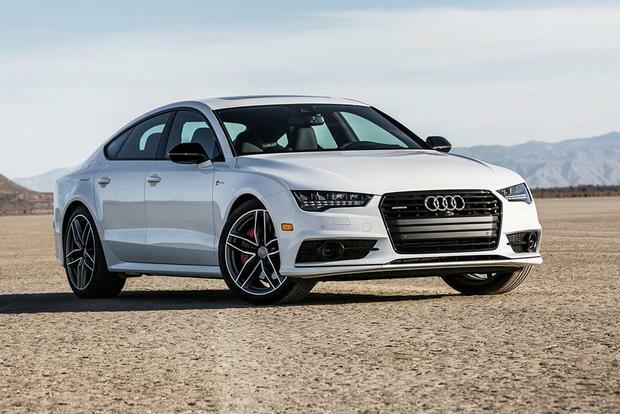 The A7's gasoline engine, called 3.0T, is boosted to the tune of 23 horsepower while improving consumption by a few miles per gallon. A power-adjustable steering wheel is now standard, and massaging front seats are optional. New infotainment options are available, such as INRIX online traffic services, web radio streaming and Apple's Siri Eyes Free feature , which includes voice-activated controls plus audible text messages and notifications. The system is upgraded with a faster processor and links to AT&T's 4G LTE network. Oh, and there's a new interior color of cedar brown. The badge says 3.0T, so it's reasonable to assume a turbocharger is involved. However, this 3.0-liter V6 uses a supercharger to kick out 333 hp and 325 lb-ft of torque. The Environmental Protection Agency estimates are 20 mpg in the city, 30 mpg on the highway and 24 mpg combined. Pretty good for a powerful luxury car. It manages 25 mpg city/38 mpg hwy and 30 mpg combined, while coaxing 240 hp and a glorious 428 lb-ft of torque from its diesel-powered, turbocharged 3.0-liter V6. Both cars employ an 8-speed automatic transmission with an all-wheel-drive system. The 2016 Audi A7 comes in Premium Plus and Prestige trim levels with either the supercharged gasoline engine (3.0T) or the turbocharged diesel (TDI). Premium Plus brings 19-inch alloy wheels, adaptive LED headlamps with LED running lights, LED taillights, a sunroof, a power liftgate, front and rear parking sensors, a rearview camera, blind spot monitoring, a collision-mitigation system, keyless access with push-button start, a Drive Select system (which provides electronic adjustments for steering, transmission and throttle calibrations), quad-zone automatic climate control (including separate rear controls), leather upholstery, heated power front seats with adjustable driver-side lumbar and memory functions, powered tilt-telescopic steering wheel, Bluetooth, iPod integration and a 10-speaker audio system. 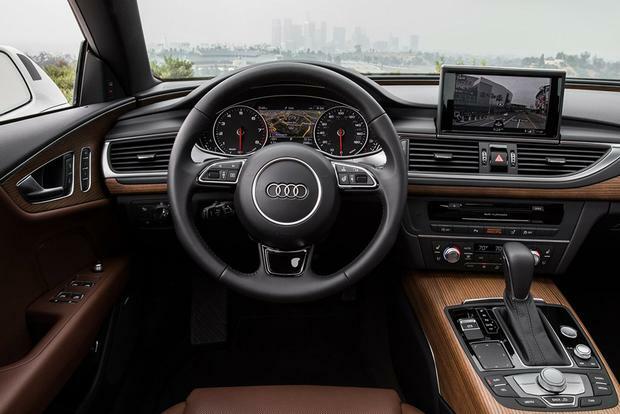 The infotainment system is Audi's top-of-the-line MMI Plus, which includes an 8-in high-resolution touchscreen display, navigation with Google Earth compatibility and voice recognition software, Audi Connect with online services (including mobile Wi-Fi) and the MMI Touch handwriting recognition pad. Prestige adds a head-up display, LED cabin lighting, cooled front seats with passenger lumbar adjustment and a Bose surround sound audio system. Options include a Sport package (19-in or 20-in wheels and sport-tuned suspension), the Cold Weather package (heated steering wheel and rear seats), the Black Optic package (requires the Sport package and adds glossy black trim plus special 20-in wheels) and a Driver Assistance package (automatic high beams, adaptive cruise control, an upgraded collision-mitigation system, a corner-view camera system and an advanced lane-departure warning system). Standalone option highlights include infrared night vision, Bang & Olufsen audio and power-closing doors. The 2016 Audi A7 comes with stability control and 4-wheel anti-lock ventilated disc brakes, along with eight airbags as standard (front, front-side, front-knee and full-length side-curtain). Rear-side airbags are optional. Many safety features are offered, including active-lane assist (with automatic steering correction if the car wanders from its lane in the absence of an active turn signal) and a corner-view camera system (notifies the driver of oncoming vehicles and other obstacles hidden from view while turning). There are also two different collision-mitigation systems. The standard system offers pre-crash driver alert, rear brake-light warning flash and accessory preparation (including seat belt tensioning and window closing), while the upgraded Driver Assistance package adds automatic emergency braking. Few automotive interiors are nicer than the A7's. Materials are superb, fit and finish are exemplary and practically every touched surface exudes class. The 3.0T engine is a fine choice, delivering strong and smooth acceleration virtually from idle to redline. The TDI is remarkable. It's a few tenths slower in the sprint to 60 miles per hour (5.6 seconds to the 3.0T's 5.2), but the TDI's superior torque is generally more fun, especially around town. Factor in that fantastic 38 mpg hwy, and this is one of the best combinations of power and efficiency available. Despite sharing most of its mechanicals with the A6, the A7 seems more athletic and composed through corners. The all-wheel-drive system sends 60 percent of its power to the rear wheels and 40 percent to the front wheels for a pleasing balance, although it can redistribute whenever necessary. The ride can be a little jiggly over rough pavement, even with the standard 19-in alloy wheels. It might be tempting to go for those 20-in alloys, but ride comfort will suffer, especially with the optional sports suspension. 2016 BMW 6 Series Gran Coupe -- A 4-door version of the 6 Series offering two excellent turbocharged gasoline engines (an inline-6 and a V8). No diesel option, though, and all-wheel drive is another pricey option. 2016 Mercedes-Benz CLS-Class -- Not a hatchback like the A7, but does provide the option of more muscle, thanks to an excellent turbo V8. 2015 Tesla Model S -- More expensive, but there's a ton of money to be saved in fuel bills. It's a joy to drive and look at, as well. Used Porsche Panamera -- Similar in concept to the A7, this car has a beautiful cabin, plus a choice of excellent engines to exploit a brilliant chassis. Although the TDI diesel engine will run you an extra $2,000 or so, it's worth it. Thirty-eight mpg has never looked or felt so good.